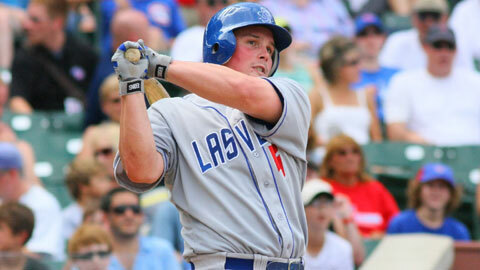 The news broke late last night: The Toronto Blue Jays have optioned Travis Snider to Triple A Las Vegas. My initial reaction was one of frustration. Snider has the highest upside! Snider’s been jerked around so much, he deserves a real shot! If Snider was on any other team, Alex Anthopoulos would trade three relievers and a bag of popcorn for him and then let him play every day! TRAVIS SNIDER HAS LIGHT-TOWER POWER, DAMN IT. I’m sure most of you have seen it already, but if not, check the 40-second mark in the above video. That was 2008. Snider was 20. He’s still only 24 (math!) and anybody ready to write him off is, well… foolish is probably the nicest word to describe those people. So yes, I’m frustrated that Snider’s not going to get his much-deserved shot at the start of this season, but maybe it’s not such a bad thing. Eric Thames is not a bad player. Not even close. 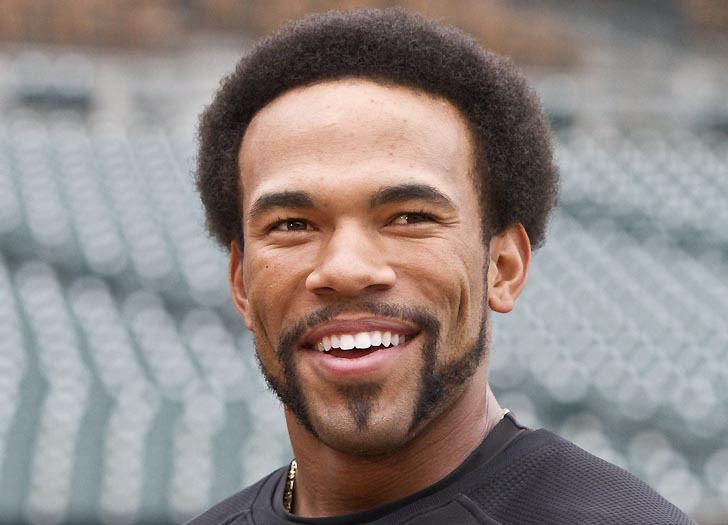 If you can against root against Eric Thames, I don’t know that we can be friends. He works hard, he plays hard, he always looks like he’s having fun AND he can hit. He’s not Snider, but he doesn’t have to be. Thames put a .262/.313/.456 (batting average, on-base percentage, slugging percentage) slash line last year and he did that over nearly 400 at-bats. He could learn to take a few more walks, but the power certainly seems real. If he can improve at getting on without sacrificing the power, he could be something special — or at least above average. But where does that leave Snider? If he goes down to Vegas and mashes the minor-league pitching as he usually does, he’ll certainly be deserving of another shot in the bigs, but what position will he play? I have a lot of hope for the 2012 Blue Jays, but there are a lot of question marks surrounding them. Particularly at first base. If Adam Lind and/or Edwin Encarnacion struggle at the plate again, the team can’t afford to give them endless opportunities. It pains me to say it, but Lind’s been one of the worst hitters in MLB over the past two seasons. Sure, maybe he can regain something of his 2009 form but, without some form of improvement, he no longer deserves an everyday spot in the lineup. Encarnacion, when he’s on his game, he’s one of the best hitters going. But when he’s off? It’s ugly. 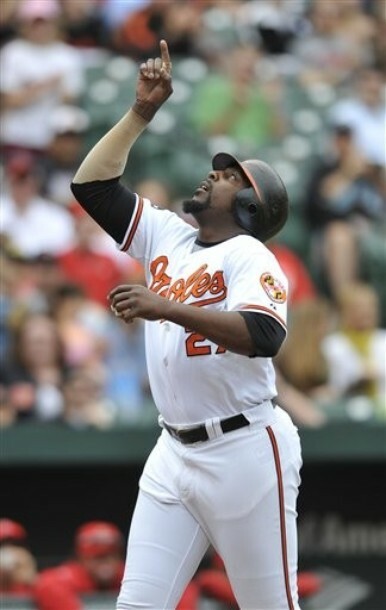 Maybe the DH/1B role will lift the weight of 3B and the E5 moniker and allow him to focus on hitting well. Or maybe he’s just another streaky player who’s a better fit for a bench role. Both Lind and Encarnacion are going to get a shot to prove themselves worthy, but if either struggles and the team does something about it (as it should) that will open up the DH spot. Snider’s a better fielder than Thames, so it’d be a natural fit for Thames to DH while Snider patrols left. And if everyone comes out swinging and no spots open up for Snider? That’s not a bad problem to have, especially for a GM who seems interested in adding pitching. Some people, including (very) occasional poster to this site, Squizz, have argued that the argument between the manager and the umpire serves no purpose and should be taken out of the game. Personally, I enjoy watching a manager chew out the umpire as much as the next guy — unless the next guy is Squizz — but I do agree that, in general, the argument accomplishes next to nothing. But there are instances where the argument serves a purpose and can be beneficial to the team in ways other than the slim chance that the ump will see the error of his ways. 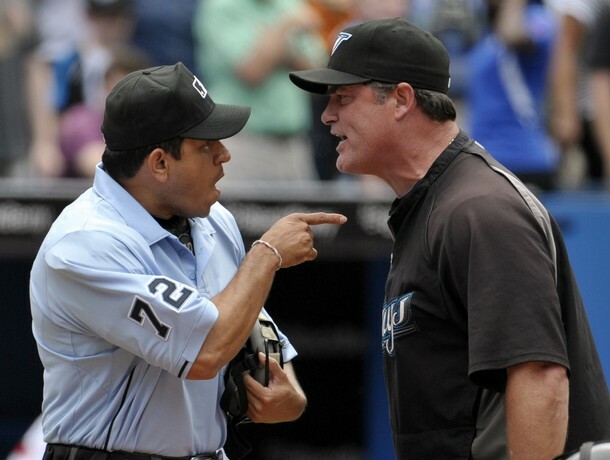 For example, take John Farrell’s argument with home plate ump Alfonso Marquez during the 9th inning of Saturday’s game. Jon Rauch and his blowup will (deservedly) get more attention than anything else that happened in that inning, but Farrell’s argument with Marquez is far more interesting to me. Sure, Farrell was probably upset that he had just been tossed around by one of his pitchers. And yeah, he was likely upset — and justifiably so — about the horrendous game Marquez called, but, to me anyway, that’s not why Farrell got himself tossed. When Rauch went ballistic, the Blue Jays had nobody warming up in the bullpen. After Rauch lost it, Farrell made sure to get one of his coaches to call the pen and visit the mound to talk to Shawn Camp before returning to Marquez and engaging him a lengthy argument. Why would he do this? I checked on the MLB.tv archive and, because the cameras were focusing on Farrell, I can’t find a video record of Camp warming up. At the game, I was also watching Farrell and really paying attention to Camp. And that’s the thing: Who was paying attention to Camp? I know J.P. Arencibia was, because Camp was warming up throughout the whole argument, but was anybody else? I can’t be sure, but I’d be shocked if Camp didn’t throw more than the eight warmup pitches that MLB allows. And if that’s the case, if Farrell’s arguing allowed an ice-cold pitcher to get a little warmer before facing live bats, that’s an argument that definitely serves a purpose. What the league will do with Rauch, I don’t know. I do feel like the team should probably take some kind of disciplinary action against him though. You can’t just let a player throw the manager around like that, can you? I was worried about the fans at Saturday’s game. I thought they might be overcome with Roy Halladay love to the point of forgetting which team they should be cheering for. I was pleasantly surprised that the cheers for Doc were limited to the beginning and end of the game. Watching Jose Bautista hit a home run is like nothing else. I knew this, you knew this, we all knew this, but it was really driven home during Friday’s game. Eric Thames’ home run was mammoth, but Bautista’s just felt more exciting, even if he didn’t hit the fourth deck. I’m getting the feeling Thames could be something that’s somewhat special. I could see him as a contributing member of this team for quite a while. Wasn’t it nice to see John McDonald get a couple of hits off Doc? Eric Thames seems like a great guy. If you’ve heard him talk, you know how contagious his enthusiasm is. He’s a hard worker, dedicated to succeeding in the game — he’d have to be to come back from the injury he suffered in college — and succeed he has, posting great numbers throughout the minor leagues. He did so well in the minors that, when Adam Lind got hurt, the Jays designated Jimmy Robert Ray for assignment to get Thames on the 40-man roster and call him up to the bigs. Alex Anthopoulos did this despite having potential replacements for Lind on the 40-man already. Yes, Thames has a lot of talent, potential and a great personality to boot. This is a guy you basically have to root for. TRAVIS SNIDER IS ONLY 23 YEARS OLD. What Snider is, is a young player who earned himself his first shot in the majors when he was only 20, then was mishandled when he got there. Hitting low in the order and being hidden from left-handed pitchers is not how a guy’s going to develop his talent. What should Toronto have done with Snider is what Florida did with Mike Stanton. But it’s too late for all of that now. What happened with Snider happened and now he’s in Las Vegas and, hopefully, will get the developmental path he should have gotten earlier in his career. So, yes, root for Thames to succeed, be happy for him. I am. But please, please don’t use Thames as proof that Snider is finished. Eric Thames pic courtesy John Lott. Travis Snider pic courtesy MILB.